After the patriotic singing in front of the Oulu City Hall, I watched the choir walk away with their torches to the cemetery at Intiö, where there was another, smaller ceremony. Meanwhile, I rushed back to the flat to do what people do all over Finland on Independence Day. 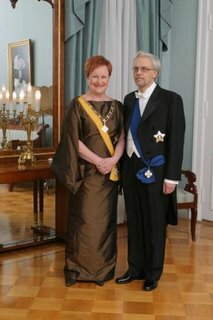 I turned on my TV and watched the annual Gala Reception held at the Presidential Palace in Helsinki. This, too, is a Very Big Deal. There were 1,800 people at this year’s event, and it appeared that each one went through the receiving line to shake the hands of President Tarja Halonen and her husband, Dr. Pentti Arajaervi. I wasn’t surprised that the TV cameras were there to cover the poo-bahs and nabobs of Finnish high society as they pressed the flesh of the republican queen and her prince consort. What surprised me was that the cameras remained riveted on the receiving line for what seemed like hours. (I didn’t know enough to time it.) The thing is that this—the receiving line—was not preliminary to a main event. There would be dancing later, but this was the main event. Out of devotion to this blog, I watched the whole thing despite the fact that I didn’t know enough to ask, let alone answer, the most basic questions, which, according to Jukka Laakkonen of the Oulun Ylioppilaslehti (the student newspaper here), were “Who will have the most amazing dress this year? Will the prime minister arrive alone or with someone special? What will happen if Olli Saarela and Eero Heinäluoma should meet in the wc-queue after few drinks? Will Mr. Lordi arrive with his mask on or will he arrive at all?” (“News in Brief,” 05.12.2006, p. 6). I suspect some readers might be wanting a little background here. I’ll do my best. Since 2003, Finland’s prime minister has been Matti Vanhanen, who is divorced and has been the subject of numerous tabloid stories, despite the fact that he is a teetotaler, a centrist, and generally pretty boring. On the other hand, he stands tall at 6 feet 5 inches, and Jacques Chirac—who keeps making cameo appearances in this blog despite my best my efforts to keep him out—once referred to him as “the sexiest man in Finland.” I have seen pictures of the Mr. Vanhanen, but I wouldn’t recognize the man if I ran into him in the herkku at Stockmann’s. Olli Saarela is a film director who is married to the present Minister of Culture. Eero Heinäluoma is the Finance Minister. In a dispute that somehow arose in budget negotiations several months ago, Mr. Saarela called Mr. Heinäluoma a “miserable, big and bald-headed sissy.” As for Mr. Lordi, he definitely did not arrive in his latex mask. I can say that with confidence; I watched the whole bloody program. Whether he arrived at all, I couldn’t say, because I don’t know what he looks like--I mean, without the mask. Tarja Halonen’s open face, and especially her broad, easy smile—yes, she does look like Conan O’Brien—are immensely appealing. She and her husband did well to greet 1,800 guests without having to ice down their swollen hands. I think her feet were killing her. For a country that seems egalitarian in the extreme, the Gala Reception certainly featured a very large number of sashes and epaulets, not to mention large medals dangling on chains from wrinkled necks. The sashes and epaulets and medals may help to explain the “now equally-traditional reception for the poor” that was held in Hakaniemi Square. That’s a quote from the Helsingin Sanomat (click on the title of this post above for a link). On the other hand, it doesn’t begin to explain how “anarchy” would help to address Finland’s “inequalities,” whatever they might be. I noticed that most people just walked up to the President and stuck out their hand. Every now and then someone would bow before offering their hand, and that seemed to me a lovely way of showing respect for her office. In the Far East, batters bow to the umpire before entering that batter’s box. We don’t bow anymore, do we? It’s a shame. I would draw the line at the curtsy, though. I noticed that many people fawned over the President and then dispatched Dr. Arajaervi with something like a perfunctory glancing blow. I hope someone was taking names. I couldn’t help but notice the uncanny instinct that people have for pairing off--springer spaniels with springer spaniels, beagles with beagles, mastiffs with mastiffs, as if they had been matched up by Noah himself. Every once in a while, there’d be an Irish setter (usually a young one, female) paired with a bloodhound (usually an old one, male), but not very often. Really, I’ve never seen a better argument against central planning. People can do these things for themselves, by golly. And when everything was said and done, the hosts moved to another room in the Presidential Palace, and there commenced yet another receiving line, this one (I think) featuring bishops and university rectors and senior civil servants. Whatever they’re paying her, it isn’t enough. Yes, it's boooooring. And yes, it seems to be a big deal to many a people. Personally I think that people watching people shaking hands for more than 2 minutes got something very wrong with them. yes, well, i know there's something very wrong with me, but i thought it was my duty, you know, out of devotion to the blog and all... Kippis and hei hei. Some Americans do bow! Catholics (well, good Catholics who are paying attention) bow before receiving communion. They also practice another nearly dead practice, kneeling.